Last weekend when I was at the Blogon UK I had the chance to meet a lot of amazing toy brands, I will post one by one all the toys they let me try and were included at the goodie bag, like the Magicube by Geomag that I want to talk today. So thanks Geomag for this precious toy! Let me say I am a big fan of Geomag toys since I discovered them a long time ago in a trip to Germany, I couldn't resist to purchase it for one of my cousins, I find their toys original and interesting for any child that plays with them. So when I saw the Magicube that was included at the goodie bag I couldn't believe it, my little one would be able to play with them too and I didn't know this new range, a way to play with cubes and stickers at the same time, you have to recognise that is something astonishing and perfect to spend hours playing with them. 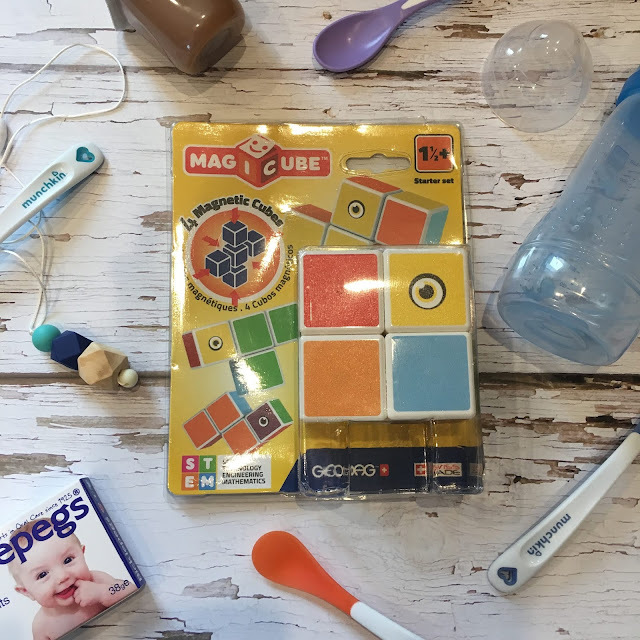 This is a beginners pack, it only comes with 4 cubes, but if you have a little child this is perfect, you don't need more of them, they will have plenty of ideas to play with them! And is perfect to start teaching our little ones the colours! But, if you have an older child, you should take a look at all the Magicube range, they have a lot of interesting and original designs! The price is not expensive, between £10 and 3£0, depending on the age you want and how many pieces are inside. I liked very much the Magicube Castles and Homes, it will be on my little one Christmas list for sure! Take a look at how my little one played with the Magicube... (Aiden is 31 months old). The original thing of this toy is that the magnets inside adapt on the pieces you try to connect, making them to attract to each other instead of repelling. 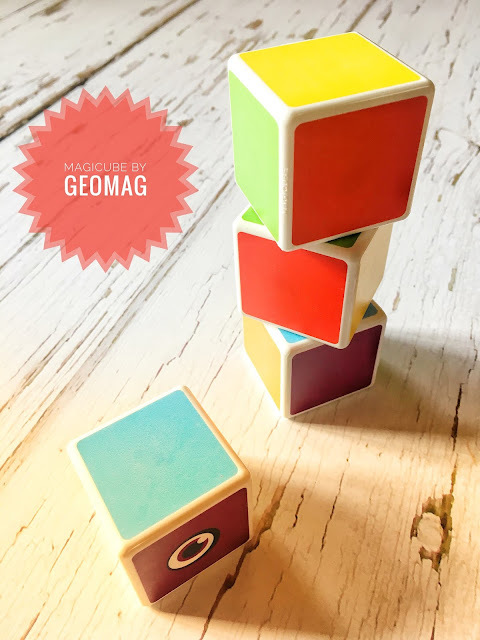 If you are starting to look for the toys for the Christmas list of your little ones, I highly recommend you to take a look at the Geomag toys, they are quite versatile, a way to make our little ones flow creativity, precision and of course, the colours!